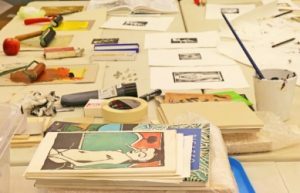 This one-day workshop offers you the chance to learn the basic principles and techniques of lino and Japanese woodblock printing. It will suit anyone wishing to try out or refresh their skills in this ancient and fascinating artform. It will be particularly suitable for teachers or art and design students, and will provide brilliant background knowledge for anyone planning to visit the major Hokusai exhibition in London later this year. Andrew Parry, the tutor, has extensive experience as a printmaker and teacher. He will teach you how to select and simplify an image, cut your design into your block, ink up and print. You do not need a large printing press for these printing techniques which means that after this workshop, you will be able to make prints in your own time. The workshop will include discussion about tools and equipment. Andrew will also point you towards the work of master practitioners in the craft of relief printing. All tools, equipment and materials are included in the workshop fee of £45.